A while ago, I did a series of posts about custom iDVD menus. At the end of the article, I mentioned that there were several little tricks that I didn’t cover. 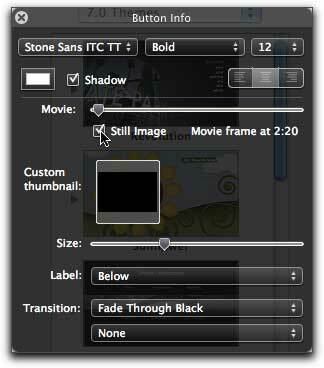 Well, here are five iDVD tricks that I’ve found particularly useful. I love Apple’s products a lot, but that doesn’t mean that I want them putting their logo on my DVD menu. To turn it off, just go to the iDVD menu and choose Preferences. Under General uncheck the box next to Show Apple logo watermark. Even with HDTV, you still want to pay attention to the TV safe area. How do you know where it is? 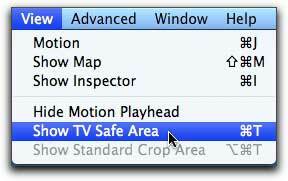 Go to the View menu and choose Show TV Safe Area. iDVD will draw a red box around the TV safe area, helping you make sure that your menu doesn’t get lost on an older TV. You may want to turn the TV safe area off before you test your DVD, though. For some reason iDVD leaves the red box on in preview mode. After I posted my custom DVD menu articles, I discovered a very interesting thing. When you create a scene selection menu from chapter markers, iDVD automatically uses the entire movie for every scene’s thumbnail image. This is not really a problem if your movie is small. But if you have a movie that is already pushing the limits of your DVD’s space, it can be a huge difficulty, because iDVD renders the movie once for every scene, resulting in a huge file. It’s simple, really. Find a frame from your movie, export a still of it, and then drag it into the box for a custom still frame in iDVD. That’s all you have to do. If you created your DVD with a non-self-contained movie, you will need to re-export every time that you change the movie. Besides that, when your movie is finished, it’s a good idea to throw away all of the render files to conserve space on your hard drive. If you did that and then wanted to burn another copy from iDVD, you would be faced with a lovely error. In order to fix this, just head up to the File menu and choose Save as Disc Image. iDVD goes through the DVD creation process, but this method ends with a disc image instead of a DVD. Now use Apple’s Disc Utility (in /Applications/Utilities) to burn the disc image to a DVD. So there you have five tips that make your life easier and customize your DVD menu. 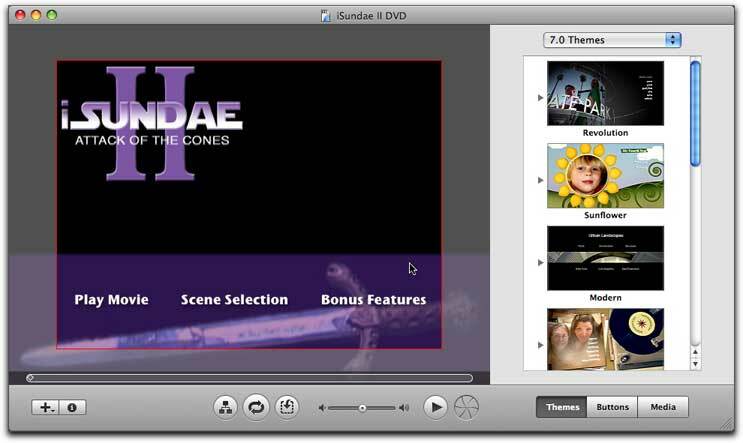 This entry was posted in Blog, DVDs, Tips and Tricks and tagged custom thumbnails, disc image, iDVD, scene selection, tv safe. Bookmark the permalink. On idvd, I keep getting this error when trying to burn a picture slideshow I created: Multiplexer Error; There was an error during muxing preparation (project conversion).” Please help?? Hi Jamie. Unfortunately, I have never gotten this error, so I don’t really know what to do about it. I did check on Apple’s support forums, though, and I found this thread that seems to be describing your problem. Thanks for the tips. One thing: I’ve been trying to get a still picture from my film, but can’t figure out how to do it. You mention exporting it, but there doesn’t seem to be a way to do it. Can anyone explain – slowly, in detail, please – how? Thanks. Any help appreciated. If you’re using Final Cut, there should be an option when you do “Export using QuickTime conversion” that says something like “Still Image”. That will export the current frame (what shows in the canvas) to a still image. Thanks! Works perfectly. I never would have figured it out. I’m not too familiar with iDVD’s built-in slideshow creator. 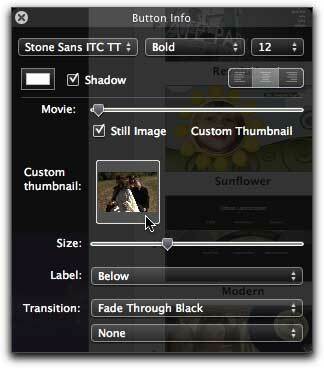 Usually when I make a slideshow, I use iPhoto’s slideshow creator, which I believe gives you a lot more control. You might try that. Regarding Jamie’s multiplexer error – i received the same error. I’m using Final Cut Express and all was well at every checkpoint, UNTIL i tried to burn a DVD or disc image thru iDVD. It appeared to occur during the last step before burning (during the audio portion). The problem was actually a plug-in i downloaded that creates a Ken Burn’s effect on multiple frames (auto pan zoom – by PieroF). Thanks for the IDVD Tips-Very helpful!! Continued success with your films. The menu with “Play Movie” & “Scene Selection” is showing up at the end of my movie when I play it in my regular DVD player but not the beginning. How do I get it at the beginning? THANKS!! It sounds to me like your movie is in the autoplay slot. Go to the DVD map. There should be a chain of items. Select the beginning of the chain and hit delete. That should solve your problem. You were right. That fixed the problem and put the menu at the beginning. THANKS SO MUCH! Thanks! This is my first time to use iDVD and the custom thumbnail for scene selection is exactly what I was looking for. Looking good! Hi Jordan, I’m glad to have come across these helpful tips! I think I’m seeing the scene-selection file size problem. I have about 30 minutes of video… The first time, I made an iMovie file without chapter markers, and the iDVD project is about 1 GB. I then did it again with chapter markers, and the iDVD project is over 10 GB! I replaced the scene selection thumbs with custom stills (genius! ), but the file size has not changed. :[ Any help? It’s been a long time since I’ve used iDVD (I use DVD Studio Pro now), so my know-how is a little rusty, but I think there’s an option somewhere for setting the encoding quality. Usually when you have a DVD that’s too big, you can change the encoding settings to fit more on the disc. I’m using the “Modern” Menu and I replaced the image, and got rid of the drop zone, however when I burn the disc, the words “Modern Main” stay on the disc, any suggestions? Is that text somewhere on the top of the screen? Most menus have a placeholder title text that you can just delete if you don’t want it to show. In the Revolution Theme 7.0 in iDVD, I’d like to turn off the thumbnails for the chapters, and use only text. I’ve clicked everything I can find and found all sorts of fun things, but I can’t seem to find out if that’s possible. Can you help? Thank you! I really wish I could help, but at this point I don’t even have a running copy of iDVD! I seem to remember there being a way to hide thumbnails but I can’t remember how to do it.